Sometimes—while hiking stretches of the Appalachian Trail, while driving cross-country, while forging new relationships—I imagine myself an explorer discovering inhabited lands. I imagine myself surrounded by plants I have never seen, mountains I have never climbed, rivers I have never crossed. I imagine the exhilarating mix of hope and fear felt upon meeting a native people—Maliseet, Penacook, Coo-ash-auke—of making that first failed attempt to communicate, using gestures more than words. I imagine that infinitely tense moment of first contact when the natives decide their reaction. Maybe they will accept me, teach me their language, tell me their stories. Maybe they will deem my motives specious and end my exploits for good. Or maybe they will simply turn me away, send me back into the unknown from which I came. Ruth worked part-time as a clerk at an antique furniture store in Montpellier, Vermont. She didn’t mind running the register or dealing with the people who came through, but would rather have been out back in the shop, restoring desks and dressers, putting her clever hands to use. On the days she worked, she stayed at her mother’s apartment, just a few blocks away from the antique store. On her days off, she stayed at her father’s farm in Cabot, helping remodel and repaint his workshop, while at night, illustrating a children’s book. The story she was illustrating was one I had written, about a lost slug named Omar who had to learn to trust others in order to find his way home. I had been working on Omar’s story for almost a year. It was to be a gift for my niece on her birthday. In his dreams, Omar could fly . .
Ruth had been illustrating my story ever since. I arrived in Montpellier from Maine on a Thursday afternoon. Ruth was still at work, but her mom was home and let me in. She was talking on the phone. I sat on the couch and waited while her boxer pup, Homer, tried to eat my hand. Earlier that week, while helping my brother frame a house, I had shot myself through the thumb with a nail gun. The galvanized spike had entered just above the first knuckle and came out cleanly just below—a needle pinning fabric—missing the joint, barely scraping the bone. My thumb was bound in a wad of gauze, specked with red. Homer was drawn to the bandage. When Ruth came home, I was pinioned on the couch with my good hand pushed to the back of Homer’s gaping mouth. It was the only way to keep him at bay. She laughed and helped pull Homer off me; then we hugged, our lean frames coming together, my sore hand cupping her shoulder. Breathing her scent, unconscious of time, I noticed a white streak in her honeyed-wheat hair. Paint. From her father’s workshop. It must have been there for days. I studied that streak for the longest thirty seconds before Homer jumped on us, and laughing, we fell away. I took Route 302 all the way from Western Maine through New Hampshire, across Vermont into Montpellier. From there, I’d only have to turn twice to be in Ruth’s neighborhood. On my way through the White Mountains, I pulled off 302 at the Crawford’s Notch parking area, in a valley lined with sheer granite cliffs, guarded by pines and alders. It’s the sort of place that demands exploration, too beautiful to admire in passing: I needed to poke around, look under stones, shake some trees. My door was open before the car had rolled to a stop. Mount Willard stood tall and ancient above me while the Saco River meandered at its feet. Over the sound of water, mountain birds blended their variegated songs, robins with flycatchers, vireos with swallows. A wooden sign showed what trails led where. I chose a short loop around the base and started walking. The notch was surprisingly deserted. A young woman with short legs walked her two Dachshunds along the river. An old man sat on a rock with his feet in the water, watching trout fingerlings examine his wiggling, wrinkled toes. Or at least, that’s what I imagined he was watching. I was twenty years old and on an adventure to see a girl and yes, my mind was operating in terms of the fantastic. Why shouldn’t it be? The sky was clear and brilliant blue. The valley smelled alive. I was walking through a storybook. I took my time skirting the mountain, barely conscious of the landscape around me as I daydreamed about where I was going, who I would see there, what I would do, my breath grown short with the hopeful lightness of prospect and expedition: Magellan charting new seas, La Vérendrye discovering the Rockies. Completing the circuit, I rushed back to my car and anxiously continued on my way west to Ruth. That first night in Vermont—after walking Homer, after cooking dinner, after working together on a crossword—Ruth and I huddled side-by-side on her porch and absorbed the details of the night, admiring the stars and their stories, listening to the kids playing in the streets, talking about dreams and other impossible things. Her hand, cut and calloused, curled over her knee like some gentle sleeping thing, so close to my own, yet somehow light-years away. Longing but not daring, I sat stilly beside her until, late, we went inside to our separate beds. It doesn’t take much imagination to guess how Vermont’s Camel’s Hump got its name. With its two round peaks and gently curving slopes, it’s like the nuppled back of a green dromedary. Early European explorers originally called it Crouching Lion, but the name never stuck. Perhaps its smooth incline and low elevation didn’t inspire the fear warranting such a foreboding title. Even still, the mountain probably seemed like a ramping lion on an October night sixty-some years ago when a B-24J Bomber cartwheeled across the mountain’s upper slopes, striking just 100 feet below the peak like a bird swatted from the sky. The one survivor lay stranded for two days on the mountainside, surrounded by shrapnel and eight mangled bodies. When rescuers finally found him, his hands were stiffened black with frostbite: too dead to be saved, they were later amputated. After the accident, he moved to Denver and started a successful legal practice. Though nearly all the debris has been cleared away—mostly scavenged by tourists for souvenirs—a large section of one wing still remains, too big to be carried away. On my second day in Vermont, as Ruth and I drove randomly through the verdant fields and forests and valleys, I suggested we hike Camel’s Hump and check out the wreckage, but for some reason Ruth didn’t want to, said I could go if I wanted to but I would have to go alone. We drove out to Eagle’s Ledge, instead. The hike was steep but short. Ruth had mentioned the ledge before, but in a way that had me expecting an actual mountain. It was only a sheer hill with a cliff face on its western bank. We crested the slope in less than twenty minutes. Passing through the dappled shadows beneath the birch canopy, we reached the bluff and sat on the edge with our feet dangling over the cool, unpunctuated, thousand-foot drop. The valley stretched out before us. Camel’s Hump watched from the horizon. When she was a little girl, Ruth and her family had often come out to Eagle’s Ledge, she and her brother playing games in the woods, along the rocks, in the dense patches of wild blueberry and briar. Though she never told specific stories, there was always a longing nostalgia in her voice whenever she spoke of the cliffs. Something important had happened here. It was a place that she wanted to show me. Or maybe I wanted to see the Ledge, had never wanted to see Camel’s Hump at all. Maybe I wanted to be invited to this place, to be associated with something resonant in her memory. Like a missionary in the jungle, I wanted to be integrated into her life, to change her and be changed. She had come to Eagle’s Ledge since she was a child. Now, she had come with me. There is a certain obvious audacity to any claim that Columbus discovered the Americas, that it’s possible at all to discover two continents already settled by millions of people spanning thousands of distinct cultures. But when Columbus first saw Hispaniola appear on the horizon—after months at sea, half-expecting the world to either end or not end, to continue on in an endless, anonymous expanse of blue—that was a form of discovery. Just like a newly arrived immigrant taking her first breath of New York or Los Angeles or Miami air, just like me crossing New England to hike cliffs with a girl I wanted so much to love me, Columbus experienced discovery. Discovery within. Discovery without. In spite of its name, the cliffs are nesting grounds for peregrine falcons, not eagles. Related, but not the same. The eagle is a bigger, darker, more foreboding-looking bird. Falcons are small and blue-backed, cunning shaping their eyes. Ruth and I sat on the ledge and watched the falcons come and go, swooping at trees, diving into the bluff. We were not supposed to be there. The falcon is endangered, Eagle’s Ledge its protected habitat. All along the trail, signs had been posted, warning us away, but we ignored them, hiked on. The risk of arrest was worth seeing their flight. In our minds, we posed no harm to these birds. Watching the falcons, perhaps inspired by their predatory charm, we began talking of gods and the forms they take in mythology. Zeus had once come as a storm of urea, and again as a lecherous swan: what deity would manifest as a peregrine? Who would be patron to the small birds it caught? Who would be the air rushing over and under their wings? All at once, a gusting wind rolled in from the valley, manifesting in an instant to engulf us, carry our voices away. In my over-reaching English major mind, the bag of winds Aeolus gave Odysseus, pulled open and untied before us. Stricken, we leaned into the gust, hair blown back, feeling the force of space wrap around us. My eyes welled and finally closed. My breath choked in my throat. That single direct push of air stretched on so long it seemed almost eternal, had always been blowing and would continue to blow, would always be pushing against me. Then, as abruptly as it had manifested, the wind stilled to a breath. Everything returned to as it had been. Hesitantly, unsure, I said to Ruth, “Did you just ask a question?” But even then I knew she wouldn’t understand what I meant. “No. Why?” From behind Camel’s Hump, dark clouds were approaching. In the open space before us, a falcon glided in to the cliffs. After coming down from Eagle’s Ledge, we drove to Cabot so that I could meet her father, but no one was around. Parking beneath a hunchbacked apple tree, Ruth showed me around the farm. The garden was dark-earthed and well-tended, smelling of sprouting things and manure. The workshop, though still under construction, was beautifully built, small but efficient, smelling of paint and sawdust. A small orchard ran alongside the field road that stretched behind the house. Ruth pointed out trees her father had grafted himself, showed me where transplanted McIntosh branches had mended into Cortland trunks. Even having grown up on a retired apple farm, I had never before seen such a thing. Inside the house, she showed me some of the strange things she had made before we had met. A book that was bound in such a way that, once you started reading, you never reached an end. A collection of glass planters that acted as their own internal environments, gathering vapor from the air outside and condensing the water within. She tried to explain her processes, the ways these objects worked, but everything she said sounded foreign to me, spoken in the language of glassblowing and printmaking. It was like the first time I had heard her blending African voices with South American drums: I was awed by what Ruth had made, these things I had never imagined and could not possibly understand. We kicked around the farm for a while longer, but her father didn’t show, so we gathered my notebook and her sketchpad from the car, then followed the field road through the pastures, twisting over slopes and around a hanging copse, leaving her father’s farm out of view. Off and on, the clouds spit and drizzled on us. Finally, opening wide, the clouds broke in a full downpour, thunder rolling. “There’s an old chicken coop ahead,” she assured me, and together we hurried up a grassy slope to a leaning weathered shed, sharp wire tangled in the weeds. Inside, it smelled like ammonia. Grey dirt covered the floor. Ruth smiled, said nothing, plopped down in the dust and began drawing: the gas can, the doorway, the grass growing in from outside where the foundation had blown away. Sitting on my can, I watched her work and tried to think of something to write, let the images come unbidden to mind. A falcon diving into sheer cliffs. Dappled light on a mountain trail. A streak of white painted in honeyed hair. In a moment, I began to write. In time, the rain subsided. “We should probably go,” she said, slapping the dust from her pants as she stood. Silently, I rose from my can and followed her out the door. The sun was shining through a break in the clouds, but far off we could see more rain approaching: we had a little time before it caught up with us. Mindful of the slick grass, we made our way down the hill toward her father’s house. “So what were you writing about?” she asked as we passed beneath a drooping dogwood. Its branches dripped water on her head. There was still white paint in her hair. “Just a detail for a scene. Of some guy hiking a mountain. He realizes he’s been looking down at his feet the whole time, hasn’t bothered to look around at where he is, where he’s going, so he looks up and the trail ahead of him, it’s beautiful. The light breaking through branches, the different shades of green on the leaves, the roots and rocks shaped like steps. It all just—” I started getting excited: the more I wanted to say, the weaker my grasp on the language became. My hands waved desperately, notebook flapping in a fist, dingy bandage shaking from a thumb. “He doesn’t want to forget this place, so he tries to memorize all the details, but— But he can’t! All the words he finds, they’re just generic nature words. He could be describing any trail anywhere. The words all the sound the same.” I wanted to say more, but my mouth wouldn’t shape the words. Shaking pointlessly, my hands strangled the air. I sighed and dropped my hands, nodding in resignation. How could I explain that everything—words, gestures, sleeping sighs—mean more than anyone imagines, more than can possibly be explained? Everything is significant. Everything bears weight. As long as you pay attention. But none of that mattered now, because my tongue was thick and heavy, unresponsive, dead. So I nodded in silent agreement and kept my peace, realizing finally that, with identical words and identical grammar, Ruth and I spoke in separate tongues. In a slow but constant dance, the world rearranges itself, rendering every map obsolete. Pangea shattered into seven smaller continents. Rodina disappeared before multicelled life ever formed. Even on a smaller scale, forests are decimated to make room for cities, while wildflowers finger up through the sidewalk cracks. Mountains are ground down for silver ore, while heaps of rubble grow tall beside the stumps. Take any place you think you know, and in fifty years, nothing will be the same. Eighteen thousand years ago, the Laurentide Ice Sheet enveloped North America in an impenetrable shell. Ten thousand years later, it had mostly melted, retreating to the arctic safety of the pole. In its slowly sliding northward climb, the glacier carved a minor trough stretching gradually across nine hundred miles of dead, frozen earth toward the north Atlantic coast. Chill ocean water flooded the canyon, then almost immediately emptied back into the Atlantic. In just a few centuries, the Champlain Sea formed and receded, leaving in its place a large, spring-fed lake. The biology of the land changed with its geography. As the climate grew warmer, hardy trees took root to flourish where once only mosses would grow. Wild plains draped the valleys, while deer and caribou ranged along the infant lake’s shore. There were bears. There were wolves. There were humans. Following the herds from the south, native tribes settled in the valleys, built settlements along the rivers. Days grew warmer, trees grew taller, but otherwise for over two thousand years, almost nothing changed. Then a man named Jacques Cartier stumbled upon what would later be called the Green Mountains, thus becoming the first European to lay eyes upon Vermont. Settlers from France and England flooded the region. The natives were driven out, pushed north to Canada. Towns and plantations sprouted in the valleys; forts speckled the shores of Champlain. Battles were fought, boundaries reset, and in 1791 the city of Burlington was founded, starting as a farm but eventually sprawling across a beach that was once hundreds of feet beneath an arctic sea. Where otters and seals once sought mussels in the muck, businessmen set up shops, artists filled the streets, and a naïve sort of optimism glittered through the air. In fifty years, someone will redraw all the maps. We drove along the twisting mountain passes between Cabot and Burlington as the rain snapped through the sky like an undulating ribbon. Beautiful Maladies played loudly on the stereo. Everything felt fine. This was to be my last day in Vermont. Tired of short hikes and long silences, Ruth and I decided to drive to the city, to change our modus operandi: we would do something new by being somewhere new. By the time we reached Burlington, the rains had stopped but the clouds still brooded, glowering. Pulling on our coats, Ruth and I wandered downtown. The streets were washed and colorless. The gutters gurgled and burped. We stopped at a rustic coffee shop with exposed hand-hewn post-and-beam to order rich drinks and sit at a window table to spy on the people passing by. No one noticed our watching. A young man in leather bummed change from strangers. A grey-haired man in a suit ate a carrot while he walked and snarled into a cell phone. When I wasn’t studying the sidewalk diorama, I admired Ruth’s hands—strong but nimble—wrapped around the curve of her mug. When she spoke, I watched her lips form words. A mother pushing a carriage paused outside the coffee shop, came inside, left the stroller behind, then returned with a steaming paper cup and continued pushing the carriage. It didn’t seem as though the child was in any danger at all. After the coffee shop, we wandered along the shore-side avenue with Lake Champlain stretching westward beside us, its dark grey waters disappearing in shifting herds of mist. A four-piece jazz band played Latin riffs at an open-air cafe; city workers drilled and cracked open the streets, yawning chasms in the pavement. The band was good, but the conglomerate noise was too much, so Ruth led the way to a small park on the waterfront, just beyond downtown. We walked quickly without speaking, leaving the clamor behind. The park was really just a series of unclaimed lots near the water. Beyond the cement skeleton of an abandoned warehouse, we found a miniature recreation of a druidic calendar erected in an open square lawn. We walked along the circle of stones, then continued down to the lake. Smooth, round stones poked out from the water. A tall birch tree leaned overhead. The world was molded in grey. Squatting on separate stones, we watched the mists thicken, the sky darken, the ripples of fish rising far away. I have no idea what we said out there with the water lapping at our feet. Though I had enjoyed my visit, a sick sensation had pervaded all the while. I felt awkward and afraid while trying my best to act casual. The nature of our relationship was bound in uncertainty: tender with distance, cold with proximity. For two nights we had talked and laughed until our throats were dry and ragged, almost gone. For two days we had driven for aimless hours through dairy towns and valley forests, silent and staring at everything unfolding before us only to disappear as we passed it by. Maybe that’s what we spoke of while sitting on the shores of Champlain—the ambiguity of “us.” Maybe through vague metaphors of magnets and electricity I explained my confused longings, my push and my pull. Maybe I explained how the universe is always reforming, extending its limits before collapsing in on itself, becoming an immeasurable dot, a singularity that explodes into a new universe that is infinitely expanding, infinitely collapsing. Maybe she replied that all the atoms in the universe are the same now as they were at the dawn of time and would remain that way forever. What will be is what is now, as it has always been. A uniform, identical plain. Nothing is anything. Everything is exactly the same. While she spoke, she tore apart a birch leaf, reshaped its edges so that it looked like a small boat, the stem as its sailor. She set the boat on the water and launched it gently with a finger. Floating away, it bobbed on the waves. Stepping from my stone to one further away, in deeper water, I scooped the boat up into my hand. “Maybe you’re right,” I said, “maybe everything is exactly the same. But I’ve never met anyone like you.” Without thinking, I tore the leaf in half and threw the pieces in the water, walked back to shore and toward the warehouse that would someday, inevitably, be replaced by something else: a parking lot, a coffee shop, a copse of overhanging trees. The marks on these maps, the lines of definition, they are always changing, always becoming something new. Everything we think is stable is changing. Fences divide our neighborhoods. And me, the explorer, the Jacques Cartier rediscovering the world on the shores of Champlain—I was returning home. The natives had turned me away. Quietly, discretely, I left for Maine the next morning. “Highway” is a relative term. The Kancamagus is just another paved road connecting two places. No tolls, no exits, just winding passes and steep grades passing through New Hampshire’s White Mountains for forty seamless miles. Kancamagus was a Penacook Indian leader who fled to Canada in the 1690s because of violence launched by English settlers. The name also refers to one of the blunt-toothed mountains the highway scales the side of, 3000 feet above sea level. Nearly all the mountains here are named after native heroes: Passaconaway, Paugus, Chocorua. Nearly all these men died defending lands now bearing their names. Aside from the occasional scenic outlook or Appalachian trailhead, the forests surrounding the Kancamagus Highway are almost completely untouched. The few villages here, among the White Mountains, hide everything but their gas stations behind the pines. All else—the dense forests and the valley streams, the vernal fields and granite peaks—stands just as it stood two hundred years ago when the highway was first laid down. I didn’t take the Kancamagus on my way to Vermont because I hadn’t known how to find it. On my return trip through, I bought a map and planned my route with the highway in mind. As it turns out, I had passed the Kancamagus twice on my westward course: both ends roughly connect to Route 302. Until I knew what to look for, I had no idea it was there all along. Vermont was still dark and overcast when I started driving through the haze of drizzle and fog that morning, but as I passed into New Hampshire, the sun broke through the cloud-cover and began to shine. By the time I turned off 302, the burdensome grey had opened wide into expansive blue. My spirits reflected the transition: bleak at dawn, the world growing brighter the closer I drew to home. Though shorter in distance, the Kancamagus took nearly twice as long to transverse, partly because of steep grades and hairpin turns, but mostly because the landscape sang to me. The purple and white flowers speckling the feet of mountains, the angular granite faces, the crystal rivers carving through valleys—this unsullied land called to me while I drove, seducing me to pull over, to step out into that thin altitudinous air, to breathe deeply, to just stop. Stop thinking. Stop worrying. Doing nothing, just being. This is what happened on my way home: I pulled off the Kancamagus and charged down an embankment until I was neck-deep in sweet-smelling grasses, until I could see nothing bearing the mark of humans. I stared numbly at all the mountains I have never climbed, all the rivers I have never tasted, all the blossoms and trees whose names I will never know. The sky was clear, the air was cool, but the sun shined warmly upon the tall wild grass, and the tall wild grass warmed me. I felt swallowed by the vast indifference of everything around me, complete and perfect, without care or definition. Like the warmth of the sun passing from the grass through my skin, the utter neutrality of this place permeated me, absorbed me, dissolving my sorrow like the sun melting cloudbanks over Champlain. A gentle wind washed down the mountain and over me, a breath so long it seemed almost eternal, always blowing and continuing to blow. Would always be washing over me. My hands hung lax at my side. I swayed with the mountain breeze. I took in the land that Kancamagus had fled to preserve, then got back in my car and kept on driving, unworried and unknowing beneath the undiscovered dome of forgiving, endless sky. Arminnius. 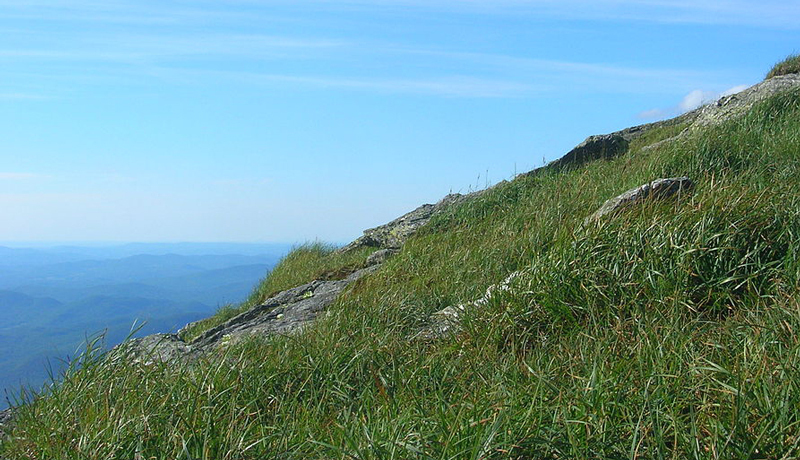 “Camels Hump Summit Grass “. Wikimedia, 25 October 2016, https://commons.wikimedia.org.